The human brain is one of the most remarkable things on this planet...but that doesn't mean it can't make mistakes, particularly when it comes to how we see the world. Here are five mind-blowing optical illusions and how they work. This checkerboard is the creation of Edward H. Adelson, Professor of Vision Science at MIT. 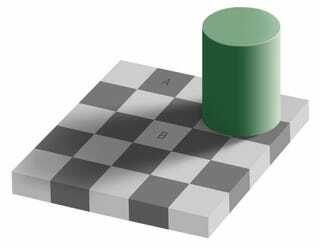 First published in 1995, it presents two squares on a checkerboard and claims that they're the same color. This seems impossible to believe - I know I busted out the MS Paint and put the two squares next to each other just to make sure I hadn't been hoodwinked. But they really are the exact same shade of gray, despite the fact that our brains seemingly refuse to believe it. So how does it work? A lot of it has to do with the shadows cast by the big green cylinder. As Adelson explains, the brain has to assess how much light is coming off the surface of each square on the board. This is known as the luminance of each square, and the brain also has to figure out how much of the luminance (or lack thereof) is caused by the color of the square and how much is created by the shadows. So the brain has to figure out where the shadows are and then compensate for them, and that's where we start running into trouble. Part of the problem is where the squares are located. Most people know enough about checker or chessboards to know that a square will be the opposite color of all the adjacent squares. That means two squares that are next to each other, or separated by an even number of squares, should be different colors. Since squares A and B are two squares away, they logically should be different colors, and our brains really seem to want to think that as well. This one seems utterly impossible until you know the secret. I mean, it seems even more impossible than your average illusion. After all, what kind of optical illusion makes a dragon's head move around like that? Surely this must be some unholy demonry...or, at the very least, cheap camera trickery. But no, your brain really is doing all the heavy lifting on this illusion. The secret is that we assume the dragon's head is convex - in other words, its features are pushed out to form a 3D head. This is because our own heads are convex, as is just about everything else we see. Because the world is overwhelmingly convex, our brains work overtime to make the dragon's head convex as well, even though it requires glossing over lots of little clues to the contrary, including depth cues, shadows, and the fact that the impossible dragon is following you everywhere you go. In reality, the dragon's head is concave, meaning all its features are pushed in. It's like looking at the inside of a mask, and it means the head will appear to move around in sync with wherever our eyes go. Actually, the dragon's head moves twice as fast as our eyes do, but this can be difficult to pick up on. This is known as the Hollow-Face illusion. But definitely don't feel bad that your mind keeps seeing that damn dragon's head as convex, even once you know the truth. Again, it's a good sign that your brain is misidentifying the right visual cues. In fact, one study revealed that the hollow-face illusion is one of the most powerful examples of how schizophrenic patients see the world differently than others. In a test of 16 control patients and 13 schizophrenia suffers, the control group mis-categorized the hollow masks as convex 99% of the time, while those with schizophrenia had no trouble telling the difference, only getting it wrong 6% of the time. This is because healthy people experience increased connectivity between two parts of the brain - the parietal cortex, which deals with top-down control and spatial attention, and the lateral occipital cortex, which deals with the bottom-up processing of visual data. The two work regions together to interpret visual data. In the case of something deliberately misleading like the hollow-face illusion, the healthy mind gets it wrong, but this connectivity is essential to a proper understanding of the world. People with schizophrenia, on the other hand, experience no such heightened connectivity, and so optical illusions like this don't fool them...but this mental dysconnectivity greatly impairs their ability to comprehend the rest of the world. This particular video is maybe the best demonstration of what's known as the Ames trapezoid, and it has the added bonus of a posh British narrator, which makes almost anything better. It's the creation of Adelbert Ames, Jr., an artist, psychologist, ophthalmologist, and...well, he was a lot of things, honestly. Ames was a master of forced perspective, creating lots of different illusions that arrange objects in just such a way that the mind can't process how big they are or in which direction they're moving. The Ames window plays upon the latter. Our brains assume the window is rectangular, but it's actually a trapezoid. The top and bottom of the window appear to be parallel, but they're actually sloping towards each other. This means one side of the window is taller than the other. When the window is placed on a rotating stand, this fact starts to interfere with how we process perspective cues. Let's say you put a normal, rectangular window on the same stand. As it rotates, the side of the window that was further way would seem to get smaller, and the side that was closer would appear to get bigger. In other words, the rectangular window would look to us like it's a trapezoid. When the Ames window is on there, things the muddled. As long as the actually shorter side is further away and the actually longer side is closer, there's no problem. But when the longer side is further away and the shorter side is closer, the window appears to stop rotating and then reverse direction, because our sense of perspective trumps our sense of continuous motion. This gets even freakier when a pipe is placed inside the window. Because the pipe isn't playing any perspective tricks, it continues to rotate normally, which creates the apparently impossible effect where it passes straight through the window. Adelbert Ames did a lot of other awesome work with perspective. His Ames rooms, in which perspective is distorted so that a person standing in one corner of the room appears to be tiny while a person in the other corner appears to be giant, remain common in the entertainment industry, and they were crucial to a lot of the trick photography seen in The Lord of the Rings movies. Ames also helped explain scientifically the seemingly mystical phenomenon known as gravity hills. These are natural places where the surroundings are positioned just right to create the illusion that a slight downhill slope is actually an uphill slope. This can make rivers appear to flow uphill, or a car left in neutral seemingly roll upwards. This might be the most powerful illusion Ames discovered - after all, it's an optical illusion that forces our brains to override our understanding of the law of gravity itself. I can't help but think of this card trick. They tell you about the color change, but you never notice anything about the face values of the cards. Yes, that's right - everything you just saw (including Citizen_Snips's wonderfully sadistic intro) was one massive misdirection. This is an even more mindbending version of the Monkey Business Illusion, which is what the earlier post was about. Here, we're so focused on trying to spot one unexpected event - in this case, how the card trick works - that we totally miss the presenters changing shirts and the set changing color. This illusion is perhaps more purely mental than the others, as it plays less on how we see the world and more on how we organize and assess what we see. It's a brilliant example of priming, which is where exposure to one stimulus - in this case, the presenters telling us they're going to do a card trick - affects how we respond to later stimuli. Because they have focused our attention on one particular aspect of what we're looking at, we tune out everything else in our field vision. If they had told us they were going to change their shirts, it's likely we'd have a hard time describing how the card trick worked. Priming can be a useful tool for turning the often chaotic mess of stimuli the world presents us with into something comprehensible. It also can lead us to miss the obvious, as we just saw, and it can cause a lot of faulty judgments. Indeed, priming is one of the key cognitive underpinnings of why we create stereotypes. For more on why priming is a necessary, if rather dangerous mental tool, check out this post over at Less Wrong. This is probably my favorite optical illusion on the internet. It's the turbo-charged version of a better-known illusion that usually involves Jesus. All these illusions work because of the phenomenon of afterimages. In the simpler version of these illusions, you're asked to look at an image for a prolonged period of time, then quickly shift your focus to a blank space, such as a white wall. This kickstarts a complex shift in the eye's photoreceptors, which causes you to see the negative, or inverted, version of the original image. Here's what happens in your eyes. You have two types of photoreceptors - the rods, which function best in less intense light, and the cones, which do best in bright light. Fixing your eyes on a single point of focus and not blinking causes the cones to get overstimulated. Normally, the eyes could fix this by moving themselves around in tiny amounts that we wouldn't consciously notice, but if the image you're looking at is too big this becomes impossible. If you overstimulate your cones for long enough, they just stop responding at all. When you switch your eyes to a blank space, the tired cones continue to send out a very weak signal, while the cones all around them that haven't been activated send out normal, strong signals. As far as your brain is concerned, this is precisely the same thing as looking at the opposite color, and so that's how it interprets what you're seeing. Thus you suddenly see the inversion of the original image, turning some vaguely recognizable black lines into a clear image of Jesus. The castle illusion takes this one awesome step further. While superimposing an inverted image of Jesus onto a blank space forces your brain to create a clear but shadowy image of him, we see something rather more complex here. The original image is an inversion of a color photo of the castle, and your brain is then forced to superimpose that image onto a grayscale version of the normal castle photo. Because you still have all the spatial information about the image right in front of you, all your brain has to do is interpret the color - and that's why a grayscale photo looks like it's in perfect color, as long as you keep focusing on that central dot. It's a truly mind-blowing illusion, and even better it's easy to create your own. Here's a tutorial from the castle illusion's creator, John Sadowski. For even more on the mindbending world of optical illusions, check out our previous post on the best visual illusion of 2010, as well as this guide to the new generation of illusions over at Gizmodo.